After months of planning and anticipation, the Bowen Classic is upon us this weekend. We hope you’ve made your plans to join us in Waco for this special event. It’s been several weeks since the devastating fertilizer plant explosion in West and all the healing is still ongoing, as it will be for a long time. 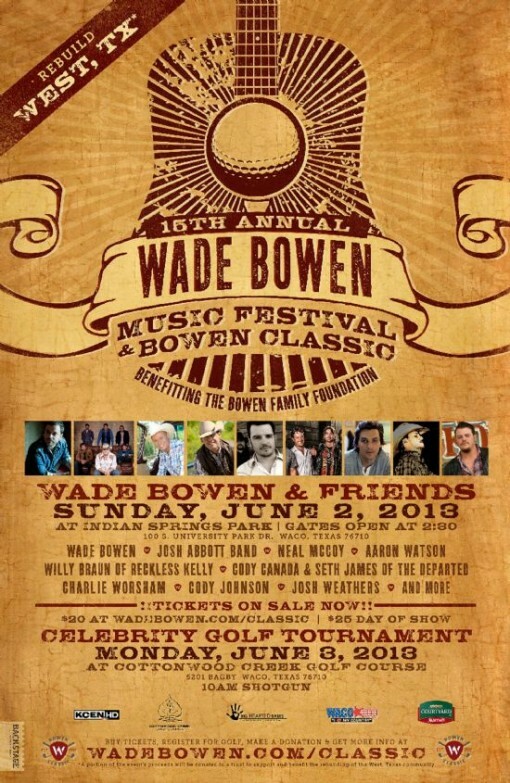 Wade Bowen has stepped forth to make this the biggest musical West benefit to be found anywhere. The Wacoan’s heart has always been poured into charitable efforts and the West tragedy hit him close to home. Wade will be joined on the bill by a who’s who of Texas/Red Dirt including Randy Rogers, Josh Abbott Band, Pat Green, Aaron Watson, Billy Joe Shaver, Roger Creager, Josh Weathers, Cody Canada, Seth James, Cody Johnson and more! If you can’t make it to the event in person, please join us online for a great evening of Texas Country and support the rebuilding of West. Tickets for the online broadcast are available at http://www.stagehop.com/wadebowen .